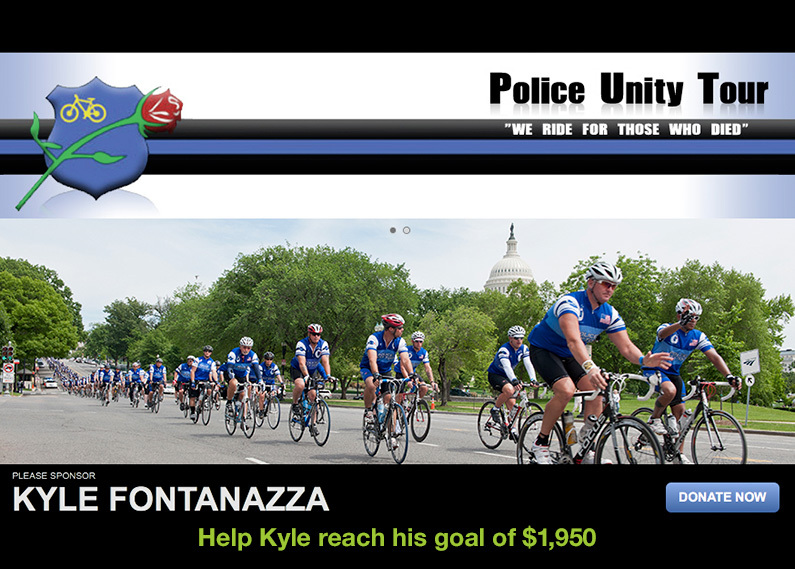 Please show your support for Kyle Fontanazza of the Butler, New Jersey Police Department in the Police Unity Tour to raise awareness about America’s fallen officers. I am excited to be participating in the Police Unity Tour with Chapter 1. The Police Unity Tour’s motto is: “We Ride for Those Who Died” and we raise awareness about America’s fallen officers. I hope you will support me by making a donation to my page today. Today in the United States, some 900,000 law enforcement officers put their lives on the line for the safety and protection of others. But that protection comes at a very high price. Every 58 hours a peace officer is killed protecting our families and communities. There have been 58,627 assaults against law enforcement officers in 2016, resulting in 16,677 injuries. The National Law Enforcement Officers Memorial honors America’s fallen law enforcement heroes who have died in the line of duty. Their mission is to tell the story of America’s law enforcement officers and make it safer for those who serve. My participation in the Police Unity Tour helps sponsor the Memorial and its programs like the Officer of the Month Award, Recently Fallen Alert notifications and other special projects. With every dollar that I raise for the Police Unity Tour, I’m doing my part to honor our nation’s law enforcement officers. Please help by supporting my fundraising efforts with a donation! Thank you for generous support!